You may remember that as a part of WINGPSAN renovations, GSP had artists from across the nation create South Carolina inspired artwork. For those just tuning in, GSP added four artist installations within this year, and recently added a fifth one! Construction Update: Signs, Signs, Everywhere Signs! 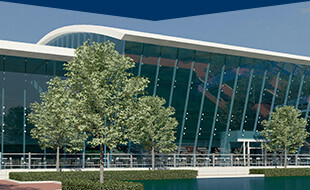 As updates on the airport continue, we’re one step closer to seeing the final product. Just this past week we started to install our new permanent outdoor signage! Designed using GSP’s signature blue and white, these new signs will prove helpful to passengers as they navigate around our construction zones. And once our renovation is completed, these signs will continue to help make traveling through GSP convenient. As the installation of our permanent outdoor signs continue, the team is also installing wayfinding signs inside the airport. From the entire team at GSP, thank you for your continued patience and cooperation throughout this construction process. If there is anything we can do to help make your travel experience more efficient, please let us know. Don’t forget to stay tuned for more construction updates and this week’s Flyer Fact Friday, coming your way soon! The construction crew continues to make strides on the development of our Grand Hall. They are continuing to successfully install the steel framework, and you can see the outline of this 3-story structure beginning to take shape. You can see a rendering of the Grand Hall in our earlier post about the North Wing. The metal decking for each level is being installed in preparation for the elevated concrete slabs. Once the slabs are in place, the floor foundations will be ready for carpet and tile—which will be installed once the structure is fully protected from the elements. Also, the last of the required footing for the Grand Hall is being poured, and the new components for the boiler system, electrical systems and mechanical systems are being installed. It is very exciting to see this building come to life and we look forward to sharing more updates with you as it continues to develop. 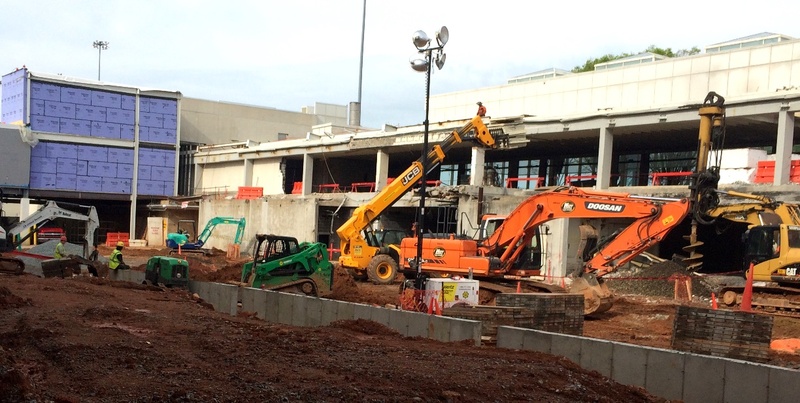 Stay tuned for this week’s Flyer Fact Friday, and keep an eye out for more construction updates coming soon. 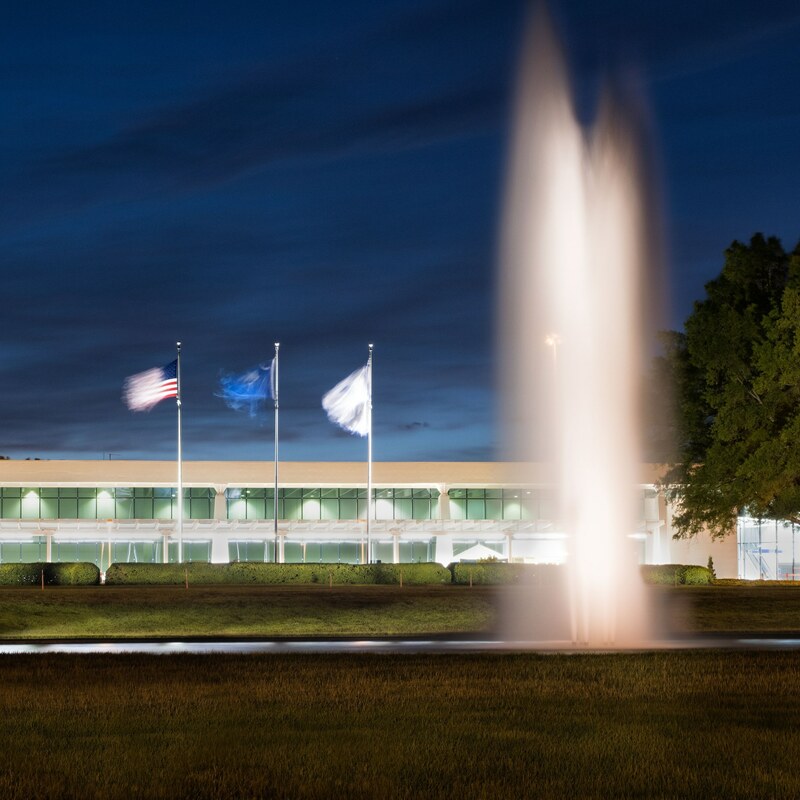 Along with boy aviator, the fifty-foot fountain on our front lawn is one of the most iconic images associated with Greenville-Spartanburg International Airport. What you may not know is that this fountain stands in tribute to one of our cofounders, Charlie Daniel. Charlie Daniel was born in 1895 in Elberton, Georgia but grew up in Anderson, South Carolina. After attending the Citadel for two years and serving in World War 1, Charlie returned to the Upstate and chartered Daniel Construction Company. 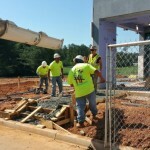 Daniel Construction was responsible for some of the Upstate’s biggest building projects at the time, such as the Donaldson Air Force Base, Bob Jones University campus, the Hyatt Regency and the Daniel Building (now known as the Landmark Building). By 1957, Charlie had a major goal in mind: bring a regional airport to the Upstate before the airports in Charlotte and Atlanta consumed the market. The first person to join Charlie’s team was Roger Milliken, whom he had previously designed, built and renovated plants with for years. 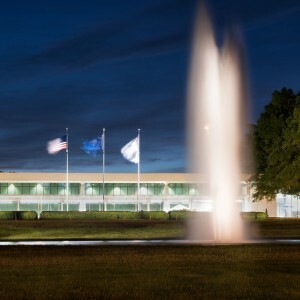 Roger Milliken always knew he wanted to honor Charlie Daniel’s memory somewhere on the airport grounds, and the fountain built to preserve the main lawn and its beauty for arriving travelers was the perfect place. Standing fifty-feet tall over its 140-fool pool, this fountain serves as a reminder of the rich history that GSP has brought the Upstate and the visionary team that had the courage to dream big. You can read more about Charlie Daniel and the airport’s rich history in Dave Partridge’s book. Stay tuned for updates on construction progress! Thomas Creek Grill is already a huge hit with travelers through GSP—and their new digs in Concourse A is truly a work of art. From the 30-foot mural on their wall to the menu and brews they serve, the entire operation is a celebration of the past and present, the traditional and unconventional. Hear from Thomas Creek Brewery owners Tom and Bill Davis as they share the story and inspiration behind the Thomas Creek Grill. Whether you are here to stay or just passing through, be sure to make a stop at Thomas Creek Grill to eat, drink and share in Tom and Bill’s passion for brewing outstanding flavors! Take a look inside our exclusive interview with Mark Johnsen, head brewer, founder, and owner of the RJ Rockers Flight Room, as he tells the story behind his latest venture—and shares the scoop behind its most celebrated feature. Watch as his little corner of Concourse B comes to life and discover the inspiration and passion behind this beloved microbrewery. From the local décor to the iconic flavors found on its menu, RJ Rockers Flight Room proudly pays tribute to its southern roots and celebrated culture. 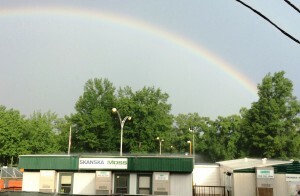 Stop by today and enjoy the familiar tastes of the Upstate! 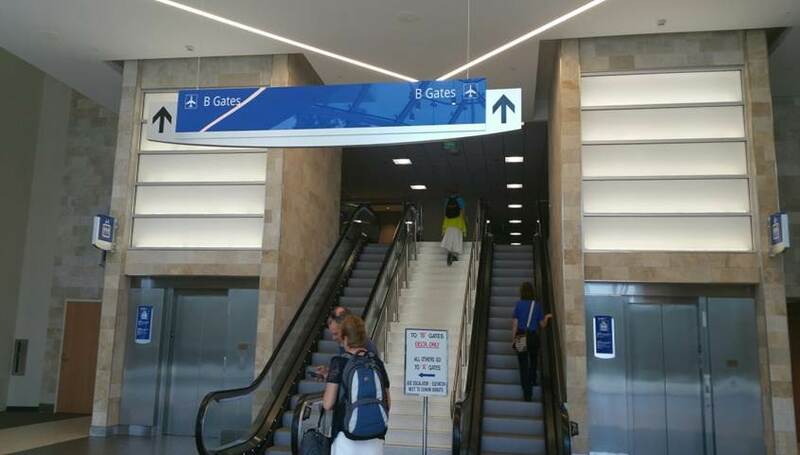 Construction update: It’s a bird? It’s a crane! 1. Demolition of the old structures requires a crane to lift the heavy components from their existing locations and move them onto outgoing trucks. 2. New steel pieces and heavy equipment are brought to the airport on trucks, and the cranes are the only way crews can unload these trucks to store the material until it is needed. 3. When the site is ready, the cranes will lift the new materials and place them into the correct locations as the workers secure the materials. Bringing cranes to an airport brings a special set of considerations. Before we can even bring a crane onto the airport facility, we must first file a NOTAM (Notice to Airmen, or a written notification to pilots before a flight advising them of special circumstances) to the FAA to get approval on an object that will be higher than any existing feature currently onsite. Additionally, on each crane, a flag and a light beacon must be on the highest point at all times and the crane’s boom must be lowered when not in use. For this construction project, we are using several cranes simultaneously and moving them around to maximize their reach. Once the structural steel is erected, most of the heavy lifting equipment such as cranes will be removed from the project. Keep checking back for more updates on WINGSPAN renovations! Today we have an update on the Facilities Department Expansion project we posted about in January. This project includes three major parts: the construction of a new facilities administration building, the construction of a new equipment storage building, and the relocation of our fuel farm. Right now, the exterior stucco is being completed on the Facilities Department administration building. The walls and roof are almost complete and electrical and mechanical work is underway for the equipment storage building. The fuel farm that has been relocated is up and operational. This particular fuel farm does not house the jet fuel (that is in a different location). This relocated fuel farm stores the gasoline and diesel for daily airport and tenant vehicle refueling and the aircraft deicer for winter months. 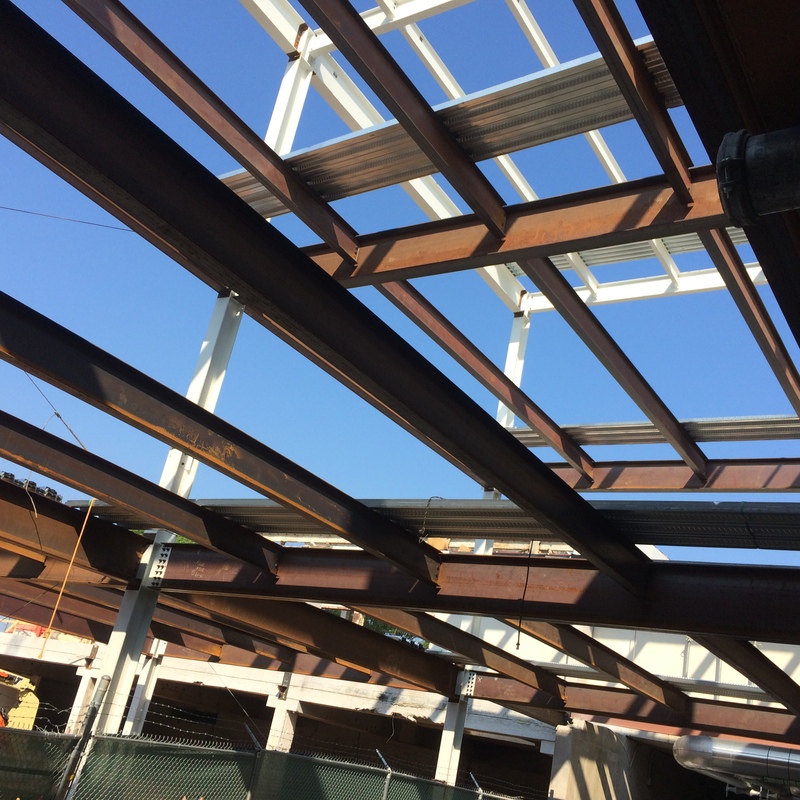 This project is scheduled for completion in early July, so stay tuned for more construction updates right here on the WINGSPAN blog! Two weeks ago we posted quite a few photos from inside the core. We are taking our readers behind the construction walls again today to see how things are shaping up for our most extensive phase of the WINGSPAN program in the core. 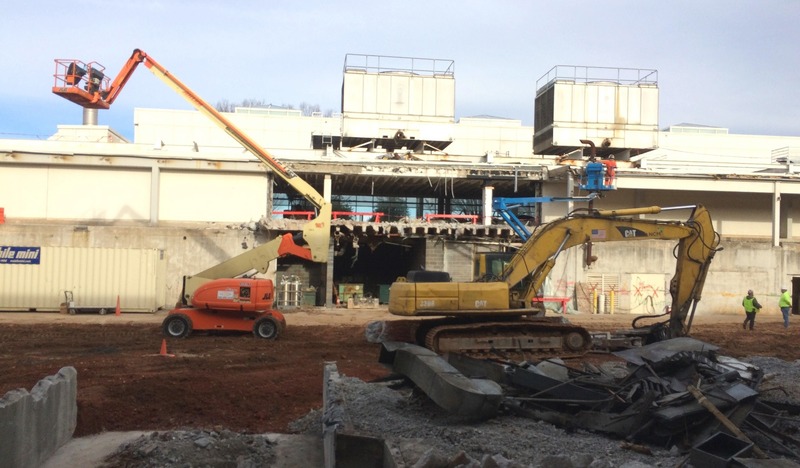 Our construction crews are working hard to build an entirely new core for the airport, including an expansive Grand Hall, a consolidated checkpoint and more food and shopping options! We can’t wait for the finished product, but for now stay tuned to the WINGSPAN blog to see the space evolve. We’ve got tales from the core for today’s construction update. 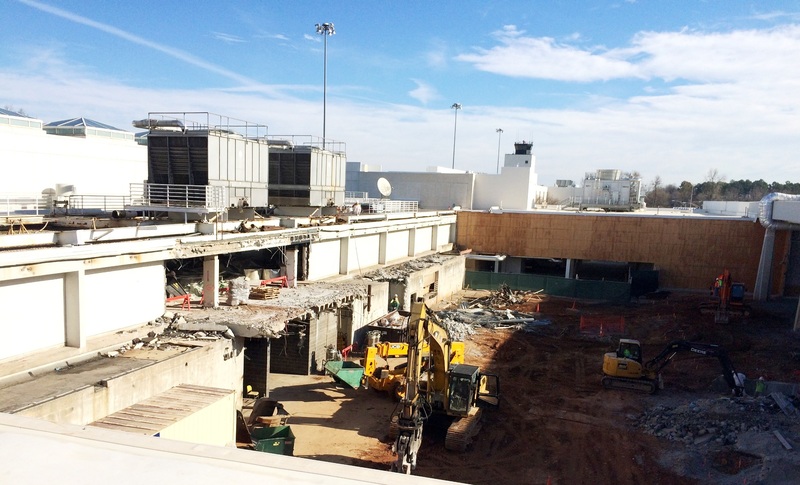 Crews are busy working on the boiler room and a new temporary screening area for Concourse A. Crews are also working behind the construction walls on building the new core from the ground-up! 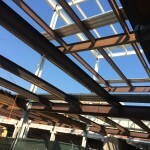 Stay tuned to the WINGSPAN blog for the latest construction updates and new Flyer Fact Fridays!